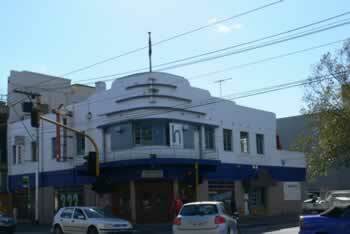 19th century, possibly around the time of the name change; remodelled in Moderne style in the inter-war years. The earlier hotel, whose name recalls the original name of Victoria Street - Simpson's Road - was built of bluestone (Rate Book 1864). It has undergone many changes since then, being re-built in brick, remodelled in the 1930s, and remodelled yet again to suit the demands of the Vietnamese restaurant trade in the 1980s and then the cafe/bar trade of the 2000s. Like so many old commercial buildings, the ground floor exterior ends up bearing very little resemblance to the older building, while a view of the upper storey reveals its origins.